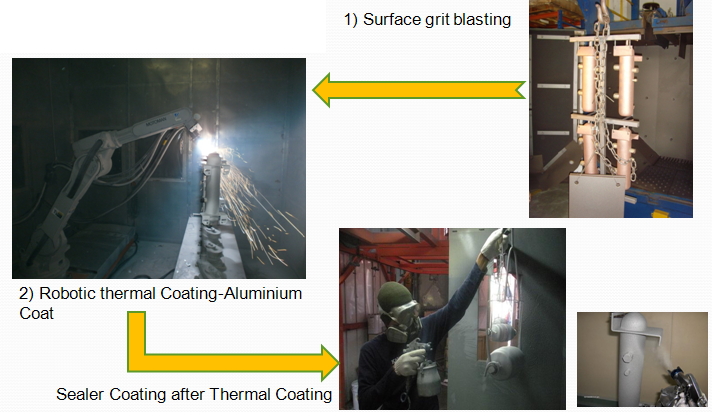 Thermal spraying is widely used to provide corrosion protection to ferrous metals or to change the surface properties of the sprayed items. We have a set of robotic thermal spray equipment that can spray various types of metal wires such as alum and zinc alloy wires onto any steel parts to form a coating of metal for corrosion protection. Our equipment have built-in safety devices and dust collectors to ensure the safety of the operators and eliminate environmental health and safety hazards.